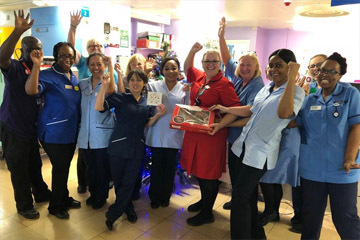 West Hertfordshire Hospitals NHS Trust is pleased that seven out of ten of their patient-facing staff have had their flu vaccination this winter. This is higher than the national average for NHS Trusts and is a significant improvement on previous years, with this year’s vaccination uptake being 20 per cent higher than during the 2016/17 season, which saw just 49 per cent of frontline staff having their flu jabs. Our goal is to get as close to 100 per cent of staff being vaccinated as possible. Healthcare workers who provide care for patients at the trust's three hospitals in Watford, St Albans and Hemel Hempstead helped with this year’s staff flu vaccination campaign which got off to a fabulous start with more than 500 staff joining in and having their flu shot on the first day alone! Last winter the UK saw its worst flu season for years and the combination of poor weather and influenza outbreaks placed significant pressure on hard-working NHS staff across the country. Locally, many wards at Watford General hospital had to close off bays in order to isolate patients with flu, which then had a knock on effect on other services provided by the trust. All NHS staff are advised to have their free flu vaccination every winter. The flu jab is safe and helps our immune system fight the flu virus. It also prevents us from spreading the virus to others, such as colleagues, family members and vulnerable patients. For those of us who work in care settings, getting the flu jab is an essential part of our work. Public Health England (PHE) have advised that younger adults of working age adults seem to be the group most affected by the flu virus this year. The good news is that they’re confident that this year’s vaccine is a good match for the strain of flu that is circulating. It's therefore vital that any staff who are in contact with our patients have their flu jabs as soon as possible, before peak flu season hits us in February. Tracey Carter, Chief Nurse and Director of Infection & Prevention Control, said: "Over the past few weeks, we’ve seen an increase in the number of patients being admitted with flu which is putting pressure on our hospitals, with several wards already having to close bays due to the virus. We’ve also seen more activity related to flu in our Intensive Care Unit this year, compared to previous years. I’m grateful to all our fabulous staff who have taken a few minutes to protect themselves and our patients by having their flu jab. I’d encourage anyone who has not yet had their jab to do so as a priority. It’s not too late."